The other day I took delivery of a load of firewood (not a moment too soon as it turned out, since our heat pump died shortly after). This was one of the pieces: the bark had come off, and the work of the larvae of bark beetles was showing clearly. 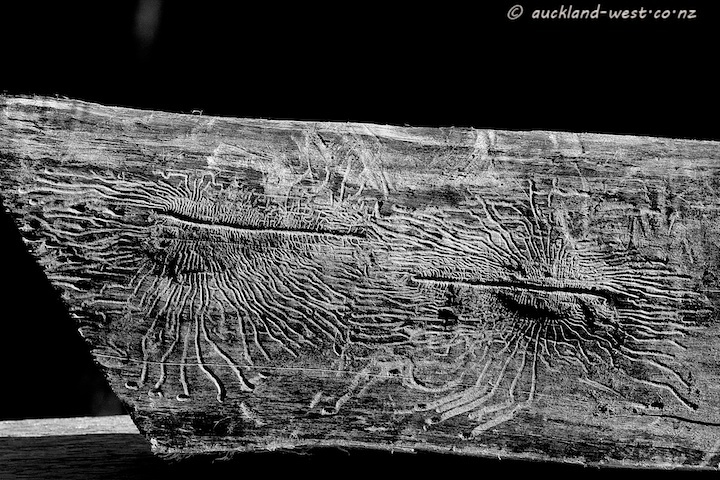 This is how I think it works: A bark beetle carves out a ‘brood gallery’ through the bark (two of them visible here), laying eggs along the way. Eggs hatch, larvae eat, forming these food galleries, and when they have matured, they pupate in those cosy nests at the end of their corridor. When the time comes they find their way out through the bark and the cycle repeats. The art of the little creatures is fascinating. Great photo. Great patterns, and an excellent illustration of this part of their life cycle. They certainly end up making interesting patterns! Wonderful photo in B&W! Great pattern and texture! Art of nature! Wonderful texture in this B&W!